Beautiful VELUX windows installed to Government endorsed standards. Click below to see what gifts you get when you buy a window from us. Take a look at some of the recent work we have carried out. If you're thinking of a new VELUX windows installation or require repairs to your existing ones, we're your experienced professionals in Portsmouth. With a strong local reputation and competitive prices we're your obvious choice. 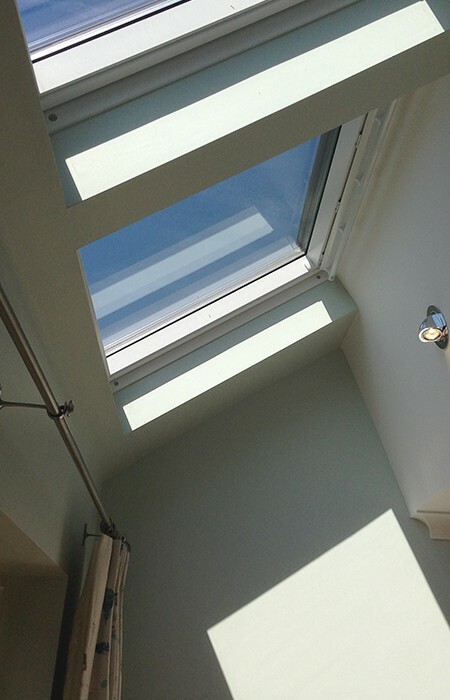 Roof windows can form the basis of a basic loft conversion - but they need to be installed properly so as to last and perform reliably over many years to come. We're Portsmouth's only VELUX Certified Installers - the highest level awarded by the company - so you know you're in safe and reliable hands with our service. These roof windows are a wonderful addition to a home and can transform what may have previously been an under used space. The name 'VELUX' has become almost a generic term for roof windows, such is the company's strong reputation created over 60 years. It's a reputation that has been built in no small part by the careful selection of accredited installers. We're delighted to be one of them. It's a sure sign we're a local company you can trust to help you make the most of a stunning VELUX window installation or effective repair. If an alternative natural light solution is desired, we'd be pleased to show how sun tunnels can help. Our service starts with a full and honest discussion of your roof window requirements with a visit to your home or premises. We'll follow this up with a full and fair quotation, and then undertake the work while minimising your inconvenience. We want to provide a roof window installation you'll be thrilled with and that will last you years. Talk to the area's only VELUX Certified window installers, call 023 9383 8225. Receive a FREE VELUX Blackout Blind with any NEW installation window. Replacement windows will receive a FREE Opening Pole.